If you haven’t heard of the term, the EPA defines environmental justice (EJ) as the “fair treatment and meaningful involvement of all people regardless of race, color, national origin, or income with respect to the development, implementation, and enforcement of environmental laws, regulations, and policies.” EJ often refers to the water and air pollution, landfills, toxic waste, power plants, industrial facilities, environmental degradation, etc. that preferentially affect people of a particular race or ethnicity. It also refers to social movements that have, with some success, attempted to rectify this. Environmental justice (and injustice) is something that should be discussed and addressed more often in the media and in politics. If you’re interested, there are a few good books about EJ out there (such as Dumping in Dixie by Robert Bullard). EJ became an important issue during the heyday of the civil rights and environmental movements, and the most successful EJ lawsuits have been based on violations of civil rights laws. EJ returned to the news in 2005 during Hurricane Katrina and its aftermath in the New Orleans region. (For example, see these articles/programs in the Huffington Post and Democracy Now.) 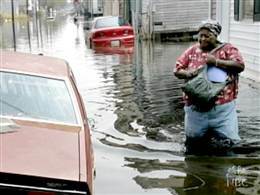 Katrina disproportionately affected communities of color (as well as poor whites), and some people argue that the reconstruction efforts should have better reflected and involved the needs and concerns of these communities. Some have made similar claims in the aftermath of the BP oil spill in the Gulf of Mexico. As we see new environmental problems and issues in the future, it’s very important for us to consider race and class when addressing them. Now we’re already seeing that climate change due to carbon emissions of people in wealthy nations appears to be preferentially affecting the poor and communities of color, especially those in coastal and island regions. For more information about EJ, I recommend checking out Robert Bullard’s website (http://drrobertbullard.com/) or following him on Twitter (@DrBobBullard).